There was a Crystal Palace FC that existed before the current club and it helped lay down the foundations of football for the world. 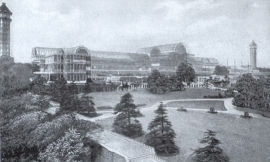 The club was made up of workmen at the Crystal Palace on Sydenham Hill and local athletes, public schoolboys and professionals from the local villages of Penge and Sydenham. In the Victorian era, being an amateur sportsman was seen as an important social distinction as the wealthy played for "the love of the game" and not because they needed the money professionalism may have offered. Founded in 1861, the amateur Crystal Palace played friendlies on the east side of the Palace grounds near Penge Common. At this time, there were no universally accepted rules for matches and they often ended in a shambles. But in 1863 representatives from the early clubs, including Crystal Palace, organised a meeting at the Freemasons' Tavern on Long Acre, London, to form a "Football Association" so a set of rules could be established. As one of the 12 founder members, Crystal Palace continued to be instrumental in the development of the FA and from 1864 to 1868, Palace's James Turner was the FA Treasurer. A number of county matches took place over the next few years to encourage use of the FA rules - the first of which was between Middlesex and a combined Kent-Surrey side - and Palace players were selected. When the Football Association launched the FA Cup in 1871, Crystal Palace were one of the original 15 teams that entered. League football did not exist back then. Palace's Mr D Allport was one of three FA members delegated to buy the first FA Cup. Palace made the semi-finals of the cup's inagural season, brushing aside Hitchin, Maidenhead and Wanderers. 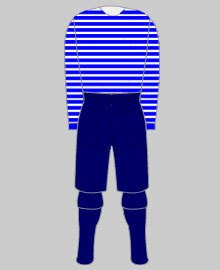 But in their club colours of blue and white, lost 3-0 to Royal Engineers - one of the best sides of that era. Scotland hosted England in the world's first official international match in November 1872 and Crystal Palace forward Charles Chenery was in the England team for that historic fixture which ended up 0-0. Crystal Palace's Alexander Morten was England's chosen goalkeeper but had to withdraw from the original squad due to injury. However, Morten was fit for his country's next match at home to Scotland and was handed the armband to become the second ever England captain. A stockbroker by trade, Morten later served on the FA Committee in 1874. Chenery scored in England's 4-2 win and was the only player to play in England's first three games. Palace keeper Arthur Savage and centre forward Charles Smith played in the fifth ever international football match - again England versus Scotland in March 1876. Insurance clerk Smith served on the FA Committee in 1875-76. The first England football team photo taken before their fifth international. No.3 is Charles Smith and No.6 is Arthur Savage. The unnumbered man is Palace official James Turner who was an umpire for the game. Palace continued playing in the FA Cup along with the usual round of friendly matches against other London sides but disbanded in 1876. It is possible they had nowhere to play their matches after being forced to leave Crystal Palace Park. Palace's last recorded match was a 3-0 defeat to Wanderers on December 11 1876. The Football League was formed in 1888. General manager of the Crystal Palace Company, Mr J H Cozens, would later form a new Crystal Palace FC as a professional outfit in 1905, which is the current club we know today. 1863: Formed the Football Association with representatives from 11 other clubs and agreed on the first set rules for the game of football. 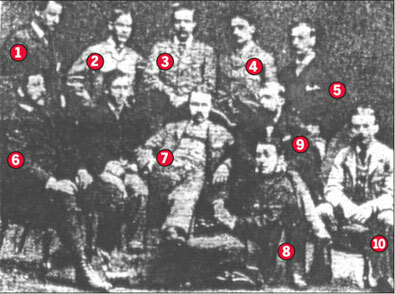 1871: Original participants of the world's first football cup competition - the FA Cup. 1872: Had one player selected for the world's first-ever international football match, Scotland vs England. *Rule 8: Whereby in case of a drawn match the clubs shall be drawn again in the next ties or shall compete again at the discretion of the commitee.